Students work with simulated moon rocks in creating "To Touch the Moon" production. "To Touch the Moon," a theater production underway at the University of Northern Iowa in Cedar Falls, Iowa, will blend drama and science to foster an explorer mindset in young people with autism. Sans space helmet but in full Apollo mode is Gretta Berghammer, who teaches drama education and theater for youth at the university. In 2014, she received the Autism Society of Iowa Stephen Tsai Award for Excellence in Autism Education. Her newest project will bring the moon shot down to Earth. Gretta Berghammer is the artistic director for the Sturgis Youth Theatre at the University of Northern Iowa. For those not familiar with autism, also known as autism spectrum disorder (ASD), it is a broad range of conditions characterized by challenges with social skills, repetitive behaviors, speech and nonverbal communication. Children with this multifaceted, neurobehavioral condition often have difficulty perceiving what other people think and feel. This makes it harder for them to express themselves, either with words or through gestures, facial expressions and touch. In the United States, one in 59 children is diagnosed with ASD, according to the Centers for Disease Control and Prevention. Berghammer serves as the artistic director for the Sturgis Youth Theatre and is the creative spark plug in the making of "To Touch the Moon," a production crafted to provide drama experiences that best support the development of pretend play, social interaction and nonverbal communication. "We are devising the piece ... creating it ourselves," Berghammer told Space.com. "I am working with 20 undergraduates who are helping research ideas and then develop them for each of the three episodes." 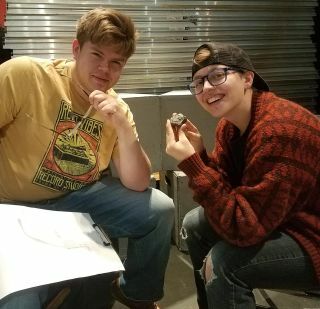 University of Northern Iowa students practice the staging of three episodes that characterize exploration of the moon. Those episodes focus on creation myths and stories about the moon; work in the NASA labs; and events on the surface of the moon. The first episode takes place in the "modern day" and the other segments take place in 1969, Berghammer said. "There won't be a 'script' per se, but rather what I call a story spine," Berghammer said, outlining a specific sequence of events that will be performed and explored in each episode. "Because the 'audience' is an actual participant, we have to be prepared for everything and anything. So while we have a direction and focus for each episode, we will also be responding to the contributions, ideas, behaviors, actions of our audience members," Berghammer said. Illustration depicts layout of "To Touch the Moon." It's a project unlike any other. A sensory-aware, fully engaging experience, staged to explore three phases of the moon story: creation, exploration and lunar contact. Rather than acting as bystanders, audiences in this immersive theater approach become an active part of the story, helping it unfold on stage. Scripted within "To Touch the Moon" are numerous events and activities such as descent to the lunar surface complete with warning alarms; making lunar rock selections and estimating weights as accurately as possible; moving about on the moon in gloves, boots and helmet; and playing astronauts on the moon who use hand signals to communicate problems, discoveries and what the world of the moon looks like. Working group meeting to discuss the drama and science of Apollo 11, which can evoke an explorer mindset in youth with autism and other developmental delays. "I want the surface of the moon to be a total surprise," Berghammer said. "To Touch the Moon" will directly serve 100 Iowa youth ages 6 to 12. There will be six performances, which will all take place in April 2019 — four performances will be with a Cedar Falls, Iowa, school; and two public performances, which are open to local young people and their families, will take place on the University of Northern Iowa campus. Leonard David is author of the forthcoming book, "Moon Rush: The New Space Race" to be published by National Geographic in May 2019. A longtime writer for Space.com, David has been reporting on the space industry for more than five decades. Follow us on Twitter @Spacedotcom and on Facebook. This version of the story published on Space.com.